The next time you get ready to mail a package, take a look into recycled shipping boxes. Cardboard is not only recyclable, it can also be reused and repurposed. 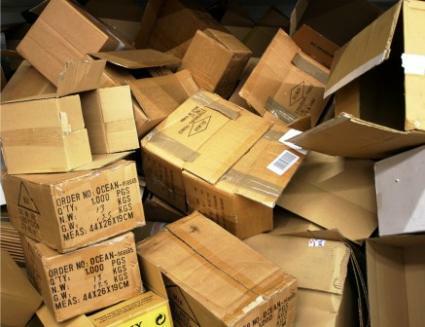 Billions of packages are shipped around the world each year, most of them encased inside a cardboard box. Much thought has recently gone into biodegradable packaging for shipments since cardboard is a recyclable material. Many consumers choose not to use traditional Styrofoam or plastic packaging for ecological considerations. Cardboard is a stiff, heavy paper product and like most paper products is recyclable. In fact, cardboard can be recycled as many as eight times before the fibers become too weak to use. Considering the number of cardboard boxes being purchased and used each year, it makes sense to use recycled shipping boxes, and then recycle the ones you have on hand when you have no further use for them. More and more companies that deal in shipping and cardboard boxes have adopted recycling programs and offer shipping products made from recycled materials. The choices for a recycled product are numerous. Many companies buy back boxes and offer a drop-off center so you can recycle your old boxes when you're finished using them. Used Cardboard Boxes: Probably the most environmentally-friendly of them all, Use Cardboard Boxes reuses shipping boxes rather than sending them through the recycling process of separation and bailing. Buy Green: This is another source for 100 percent post-consumer recycled product. Treecycle: This company has shipping supplies for every purpose, including cardboard tubes and mailers; all of the products are made from recycled material. Staples: Does your business do a lot of shipping? The same Staples where you buy your office supplies also carries recycled shipping supplies and boxes. Purchase these in bulk when you buy company supplies and save even more. Box Quest: Both used and recycled cardboard boxes are available from Box Quest. If a used box isn't going to work for you, then you can still purchase a new box from recycled content. Take unused boxes back to the store from which you purchased them; frequently, companies will buy back your boxes or reuse them. Locate a shipping center or box retailer in your area; often large retailers recycle or reuse the boxes for onsite purposes. Take the boxes to your local landfill and ask about cardboard recycling. Most towns have a program in place, even if they don't pick up cardboard at the curb. You can reuse your current boxes by simply turning a box inside out, turning the labels, company logo, and shipping information to the inside. You can now reuse this box with any carrier even if it didn't come from them in the first place. Stop by copy shops, post offices and packaging stores to ask for any used boxes. Take the boxes home for free and turn each one inside out for a reusable product that didn't cost you or the Earth. More companies are beginning to understand the importance of both recycling and reusing shipping supplies. You may discover that some boxes are printed inside and out for your convenience, or are marked for multiple purposes, allowing you to reuse a box many times before needing to recycle it. As manufacturing practices get better, the cardboard itself gets stronger, leading to a longer use-cycle. Whether you use recycled shipping boxes, or you reuse boxes, once you're finished with the box, do your part by putting the box back into the recycling bin to start the process all over again.